SERIOUS ATHLETES take a protein shake within half an hour of working out to promote MUSCLE growth and strength. Serious horses require the same and scientific research supports this. Immediately after exercise your horse will have an increased blood flow to its muscles which provide the nutrients essential to muscle repair and growth. Research has shown this to be the most effective time to feed a high quality protein such as MUSCLE & PERFORMANCE to maximise muscle development. Buy this product. Each batch is independently tested and suitable for use under Jockey Club and FEI rules. UNIQUE FORMULATION – Amino acids are the building blocks of proteins which form muscle, nine of these amino acids are ESSENTIAL, your horses diet must contain sufficient amounts of all nine in order to make the proteins required to form muscle. 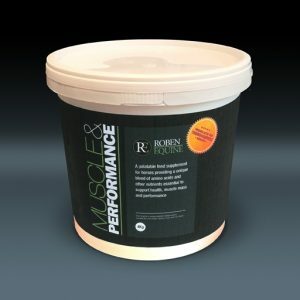 Muscle and Performance contains a unique blend of 21 amino acids along with minerals, vitamins and trace elements and is GUARANTEED to contain high levels of the NINE ESSENTIAL amino acids necessary to support muscle formation. Muscle and Performance exceeds most other competitor products on the market today in terms of its formulation and value. All horses in competition and training. Poor doers – horses that struggle to maintain condition. Horses being fed low energy high fibre diets such as late cut or soaked hay which will often be deficient in proteins, vitamins, minerals and micro nutrients.